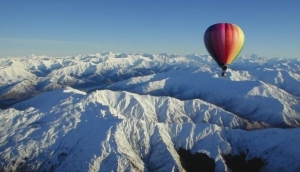 One of the best ways to see this beautiful area, is to go Hot Air Ballooning in Queenstown. Float over the lake, hover past the Remarkables, and just stand and admire this most stunning of Kiwi landscapes. Queenstown Hot Air Ballooning is a unique way to start the day. Most companies operate their trips at dawn, so you can literally watch the city wake up, as you drift over the top of them, like the king of the skies. Many hotels, guest houses and self-catering facilities will have information on your nearest balloon operator, and will likely offer discounts. You do need a head for heights, but other than that, all you really need is a fully charged camera and sense of adventure. Some operators will throw in a champagne breakfast to greet you as you come back to earth. Most trips last around an hour, and will take in sights such as Lake Wakatipu, the Remarkable Mountains, the Kawarau and Shotover Rivers, and Coronet Peak. It's a special thrill, to be floating through the Queenstown sky as the sun comes up, and for many it's the ideal way to end their visit to this beautiful area. Worth splashing out on.